Thank you www.busymummys.co.uk for this idea! The Kissing Hand – Easing morning drop off the gentle and loving way! 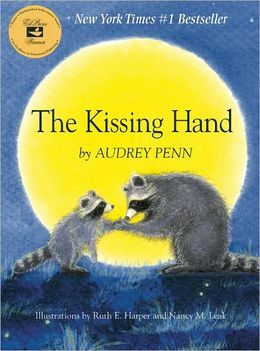 So we read the book, ‘The Kissing Hand’ about a raccoon Chester who did not want to go to school. It was as if the book was written just for my kids! Chester said the exact same words my kids used as pleas to stay at home. I wanted to draw a heart on their palm, but wasn’t sure of school rules, so we decided to use a sticker that represented the ‘Kissing Hand’ to keep with them while they were at school to give them comfort and ease saying Khudahafiz (goodbye) at drop off. My daughter chose a butterfly and my son wanted a star, none of them wanted hearts. My daughter held it in her hand, which she promised to hide in her pocket when at school, while my son wanted it stuck on his cardigan. I kissed it and wrote three things on there. M+P – Mummy + Papa love you very much and will come to pick you up very soon. You could use henna, tattoos, stickers, etc, depending on the school policy. Hide them in their pockets or pencil cases, stick them on the inside of the cardigan or even their vests, where they know where it is but it is away from other kids’ eyes so they don’t get questioned. If you can’t get hold of this wonderful book, checkout this video clip where this lady reads out the book for kids.